When I was a kid growing up in central Massachusetts, I remember that a bunch of my friends' parents worked for super high growth tech companies like Digital Equipment Corporation (DEC), Data General, and Prime. While some people reading this may not have heard these names, these companies were behemoths. In the late eighties DEC alone was one of the largest companies in the world and employed more than 120,000 people. These companies were booming at the time in an area known as the “Route 128 Corridor”. Route 128 is a highway that runs south to north about 10 miles to the west of Boston. The area was a hub for technology companies — mostly focused on semiconductors, microprocessors, and minicomputers. It seemed like almost all my friends' parents worked at one of these companies or a company that provided support to these companies. I also remember the bust that came in the early nineties when many of these companies downsized and thousands of people lost their jobs. It was a rough time for many people in the area. What I didn't know at the time was that there were a set of competitors based in Santa Clara County, California, in the area now known as Silicon Valley, viciously competing with the Route 128 companies. Companies like Hewlett Packard, Intel, and Apple. Most people now know that the Silicon Valley companies came out on top and that the tech scene in the area outpaced eastern Massachusetts significantly. Massachusetts remains one of the top 3 tech hubs in the U.S., dominates biotechnology, and is well on its way to becoming the country’s Digital tech hub. But outside of healthcare, the Silicon Valley area is far ahead and sees about 3x the number of startups and venture funding than the entire state of Massachusetts. That said, back in the mid-1980s, you would've had no idea which region was going to come out on top. It could’ve gone either way. AnnaLee Saxenian wrote a phenomenal book about all of this titled, Regional Advantage: Culture and Competition in Silicon Valley and Route 128 that examines the differences between the two regions. Having lived in and worked in both areas, here are some of the key differences between the regions that I think allowed Silicon Valley to outperform. Certainly some of the takeaways are isolated to these regions at that point in time. But as lots of cities across the country try to increase the number of tech startups launched in their communities, many of the lessons from the battle between Silicon Valley and Route 128 can be applied by policymakers and tech leaders today. This meant that people in the Valley were much more willing to take risks, start companies and jump from job to job. As they jumped from job to job and made friends with people at work, they created networks centered around their work across several companies in the region. It was common for an engineer to quit their job on a Thursday and show up at another startup on Monday. These new experiences led to more friendships and led to a ton of collaboration between companies and an openness to sharing with one another for the greater good. It was common for Silicon Valley competitors to call one another for help with technical problems. This kind of collaboration created a rising tide for everyone in the area. The power of this kind of environment is enormous. There was a separation between work and social life for Route 128 workers. For workers in the Valley, it was much more of a grey area. Workers in Route 128 tech often went right home after work and immersed themselves in their local towns, where they had ties that went back generations. Workers in the Valley didn’t have these ties. Instead of driving several miles back to their town, they were more likely to go out to dinner or to a bar in the area to talk about technologies and markets. As mentioned above, workers in the Valley would jump from job to job growing their network and gaining new experiences. Route 128 had a much different culture where loyalty was highly valued and if you left you could never come back. Workers often stayed at their jobs for 10+ years. This was unheard of in the Valley. Workers felt that they were working for the Valley — the community — rather than for an individual firm. If they decided they wanted to come back they were often welcomed with open arms. As I've written in the past, this impact is felt today as California has banned the use of employee non-compete agreements while Massachusetts has allowed them to persist. Stanford actively promoted startups by offering professors up to help with product development and created several funding mechanisms for new ideas. MIT took a far more conservative approach and was very reluctant to invest dollars or time into things that were too risky. This created artificial walls between the best tech companies and the best technical research. Many of the east coast companies claimed they had better working relationships with Stanford and Berkeley than they did with MIT and Harvard. Because of its proximity to Washington, Route 128 companies had lots of reliance on government contracts that had long term obligations that restricted innovation. It also (appropriately) led to a secretive culture that stalled collaboration with associations, competitors, partners, and other organizations in the local ecosystem. By contrast, by the early seventies, Silicon Valley companies were receiving far more financing from venture capital investors than they were from government contracts. The east coast's dependence on government contracts made widespread collaboration nearly impossible. Silicon Valley companies started around Stanford and expanded to cities like Mountain View and Santa Clara but couldn’t go too far as they were locked in by the Santa Cruz mountains to the west and the San Francisco Bay to the east. This led to a very dense community of tech companies. By contrast, the Route 128 companies were spread far and wide. DEC, the largest of the companies in the eighties, was based in Maynard, with more than 20 miles of forest separating them from the hub of Route 128. Related to the dependency on defense contracts and its proximity to established political and financial institutions, Massachusetts companies were more formal and created organizational structures that had a strong resemblance to the military. This kind of organizational design can slow innovation as the lower rungs of the ladder are less reluctant to offer new ideas and there's far less cross-functional learning. Executives had their own parking spaces and executive dining rooms. Stock options were only offered to those at the highest levels of the organization. This even applied to work attire — the uniform for 128 companies was a jacket and a tie, in the Valley it was jeans and a t-shirt. Today, something like 75% of all venture capital funding goes to three states -- Massachusetts, California and New York. As governments and entrepreneurs across the country try to expand the number of tech companies that emerge and grow in their communities, it’s important to remember that ecosystems create a lot more jobs than companies. The key is less about funding and micro-incentives and more about creating the complicated environment that allows an entire ecosystem to thrive. The other day I was writing about how I find it odd that most of the prominent venture capital firms seem to only invest in computer and software engineering companies and seem to avoid things like energy, telecom, transportation and infrastructure. The reason, of course, is that computer and software engineering is really the only big opportunity left that hasn't been significantly regulated. Well, as most of you know, that's about to change. ISPs are preparing to charge web services to use their pipes. This would do great damage to the "permissionless innovation" we've seen in the internet. The big companies that can pay the fees will flourish and the small innovators will be shut off. This would be a horrible thing for the industry, and, in many ways, the world. But, some would argue, if Netflix is using a ton of bandwidth to make huge profits, the ISPs should have the right to charge them. If the ISP market was a completely free market, that would make a lot of sense. But it's not. Most consumers only have a couple of options for which internet provider they use. If those ISPs want to enjoy "duopoly" status, they're going to have to follow some rules. With that in mind, I came across a comment from Phil Sugar the other day on Fred Wilson's blog that makes the net neutrality argument perfectly. To me here is the question. I as a citizen through my elected officials have given the cable company, the phone company, the electric company, the water company, the gas company, the garbage company the right to serve me in a non competitive monopoly or duopoly. I agreed to this arrangement because it is not cost effective to have twenty people digging up my streets, putting in wiring, plumbing, etc. However, I demand for this right that I am served as a utility. I do not want to pay more for electricity because I am running super secret trading algorithms on my computer versus having my daughter leave the light on. I do not want to pay more for my water because I am crafting the best microbrew in the world versus my wife filling the claw foot tub. I refuse to pay more per bit because a cable or telco company views it as more profitable for the company that is serving me. Now if you want to cap my total bandwidth, limit my speed, etc, that is a discussion that we can have at the utility level. I don't necessarily think every plan has to be "unlimited" because I don't necessarily want to subsidize my bandwidth hogging neighbor. Thomas Friedman had a great piece a couple of weeks ago in the New York Times, titled Why I Still Support Obamacare. I recommend checking it out. He talks about the ACA but points out a much larger economic trend -- the disappearance of the middle class. It used to be that big companies needed lots of workers to run their businesses. Those businesses created lots of good paying, long-term, reliable jobs. Those jobs are what made up the middle class. But more and more companies are finding that they don't need as many employees as they used to need in order to thrive. As an example, Facebook is a $110 billion company but only has 8,000 employees. GE, a more traditional company, has about 3 times the market cap of Facebook but has 40 times the number of employees. Fast growing tech companies are creating lots and lots of value but they're not creating lots and lots of jobs. To be in the middle class, you may need to consider not only high-skilled jobs, “but also more nontraditional forms of work,” explained Manyika. Work itself may have to be thought of as “a form of entrepreneurship” where you draw on all kinds of assets and skills to generate income. This could mean leveraging your skills through Task Rabbit, or your car through Uber, or your spare bedroom through AirBnB to add up to a middle-class income. Friedman's point in the column is that affordable, mandated healthcare is going to be critical as more people begin working independently. In many ways this is an exciting trend, but this shift in how people work, who they work for and the emergence of the "free agent" job market is going to have an extremely wide-ranging political and economic impact. It's something our policymakers need to be thinking about. 60 Minutes had a story last week on the increasing impact of robots in corporate America. Because of the technical innovation that continued during the recession, as companies begin to grow again they're finding that they can replace many of the lost jobs with robots instead of people. One of the researchers in the piece points out that Apple, Amazon, Facebook and Google are all public companies and have a combined market capitalization of nearly a trillion dollars. But together, they only have around 150,000 employees. Which is about half of the size of GE and less than the number of new entrants into the American workforce each month. Sounds like a bad thing, huh? Not really. What this comment ignores is the ecosystem that these companies have built. Each one of the companies listed above creates far, far more jobs than the number of employees that work for them directly. Apple's app store now has more than one million apps that are built and sold by entrepreneurs that don't work for Apple. Thousands of independent merchants sell their goods through the Amazon Seller Program. Amazon gives these sellers access to 200 million+ shoppers each month. Amazon also enables authors to self-publish and sell their work through the platform. There are more than 10 million revenue generating apps that plug into Facebook. Google's Android app store has more than one million apps built and sold by entrepreneurs that aren't employees. So when you dig a bit deeper you find that the combined market cap of these four companies is incredibly dependent on the work of an enormous number of entrepreneurs that are making a living through these platforms. So while GE may have more employees than these companies, the number of individual livelihoods that are supported by their platforms dwarf the employee headcount of any American company. So a father that is raising his kids and working as a firefighter putting out fires and adding direct value to society through his work making $150,000 is paying 28% of the value of his labor to the government. The investment tax -- capital gains and dividend taxes -- taxes something different. That taxes a bet. When someone invests in Facebook and the value of the stock increases, or the company pays out some of their profit in the form of a dividend at the end of the year, the profit that the investor made is taxed. This is passive income -- the investor is just sitting there watching the money come in. He's not necessarily adding incremental value to society on top of his investment (in most cases). There's nothing wrong with this -- investment is critical to a prosperous economy -- and the investor should make as much as he possibly can on his investments. But because he's adding less direct value to society, if we're going to tax him, we should tax him at a higher rate than we tax direct, value-creating labor. Simple, right? Right. So the investor that makes $150,000 per year in capital gains pays 8% less than the firefighter does for his labor. And this is why our tax code is backwards. This is why Warren Buffet's assistant pays a lower tax rate than he does. This is why, in 2009, the Americans with the top 400 incomes (who made, on average, $202 million per year) paid a lower tax rate than you did. One quarter of them paid less than 15%, and more than half of them paid less than 20%. We have to fix this. I'm not going argue what the tax rates should be (at least not today). But I am arguing that we have to flip the structure so that tax rates on labor are lower than the tax rates on investment. It's just backwards. I would suggest 30 percent of taxable income between $1 million and $10 million, and 35 percent on amounts above that. A plain and simple rule like that will block the efforts of lobbyists, lawyers and contribution-hungry legislators to keep the ultrarich paying rates well below those incurred by people with income just a tiny fraction of ours. Only a minimum tax on very high incomes will prevent the stated tax rate from being eviscerated by these warriors for the wealthy. Of course this won't fix the entire fiscal mess and I think we need to go a step further and flip the tax structure so investors pay a higher rate than workers regardless of their income. But Buffet's plan is a step in the right direction of creating a fairer tax code that incentivizes the activity that leads to greater prosperity for the country as a whole. Albert Wenger had a good post the other day noting some of the changes in employment in the U.S. over the last couple hundred years. 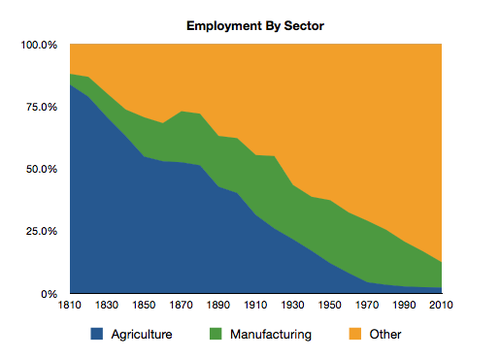 He uses the chart below to illustrate the massive losses in agriculture and manufacturing jobs. Some might argue that this chart indicates that our economy has weakened as a result of these losses. But Albert also notes that while these sectors have seen massive decreases in employment, overall employment as a percentage of the population has actually increased during this time (from 32% to about 45%). There is no doubt that this kind of change causes of lots of pain in the short term, but it's also clear that the creation of new companies and entire industries is critical to the long term health of the economy. James Suroweicki has a great column in the New Yorker this week laying out why he believes Romney’s healthcare plan won’t work. Regardless of your opinion on the matter, he calls out some important and unique qualities of the healthcare industry that should be considered when weighing both candidates’ plans; that is, weighing how much we should rely on the free market versus the government to solve the healthcare cost crisis. Unlike most consumer goods, healthcare consumers don’t have the expertise to properly value one treatment, hospital, or doctor versus another. Most major healthcare purchases are made by insurers, not consumers, so they lack a direct say on the price of a treatment. One way for a buyer to get a seller to reduce their price is to walk away and not buy the product at all. In healthcare, consumers can’t just walk away from treatments like they can a new car or a new cell phone -- they have to buy the treatment to survive. These fundamental realities of the healthcare industry make this issue far more complex than the simple big government/small government ideologies that many of us use to guide our political and economic beliefs. John doesn't want to pay for care out-of-pocket so he delays seeing a doctor. His condition eventually gets so bad that he shows up at the emergency room and gets lots of acute (and expensive) care. He doesn't have the money to pay the hospital so the hospital loses lots of money. To make up for this lost money, the hospital charges its insured patients more for their care. To make up for these price increases, the insurers raise their premiums. Because of the high premiums, people drop their insurance. By requiring John to get insurance, he’s more likely to seek care earlier, thus reducing the costs and losses to treat him, thus allowing hospitals to lower costs, thus allowing insurance companies to reduce their premiums, thus allowing more people to afford insurance. Of course what sounds good in theory may not work in practice. But it’ll be interesting to see how the mandate will impact healthcare costs should Obama win in November. There's a good column in the New Republic this week noting the irony that John Roberts decided to uphold the individual insurance requirement but struck down the expansion of state Medicaid payments. Part of the Affordable Care Act would have required states to expand Medicaid eligibility if they wanted to receive increased federal funding. They would have had to pick up a relatively small amount of the increase (10%) in return for big bucks from the federal government, but the court still struck it down. The statement made by the court in this decision essentially opens the door for states to fight any future changes that congress makes to Medicaid. And this presents significant challenges for the federal government as it seeks to protect the viability of its investment now and in the future. If the states begin to exercise too much individual control over the program, the federal government may opt to back off and simply run the entire program at the federal level. Something that, ironically, Democrats would prefer. It'd be ironic if a precedent set by the conservatives in a contentious healthcare debate ultimately leads to a more centralized government program. The piece of the Affordable Care Act that requires all U.S. citizens to have health insurance has caused quite a bit of controversy. It seems that a lot of that controversy is caused is by a lack of awareness of the details of the mandate. I’ve found that when I explain some of the details of the mandate to people that don’t like it they often end up realizing that it’s really not all that bad. Let’s start with this: there are approximately 40 million people in the United States that don’t have health insurance. And getting healthcare when you don’t have health insurance is super expensive. So when you don’t have insurance you tend to delay getting care until your condition becomes serious. Even when it’s serious, because you’re not insured, you still don’t get care through the appropriate channels, such as a Primary Care Provider or a specialist. Instead, you very likely just show up at the emergency department of your local hospital (hospitals are required by law to give care to anyone that shows up at their emergency department, regardless of insurance or ability to pay). But emergency departments aren’t setup to deal with these people. They’re setup to deal with emergencies. They’re setup to stabilize a condition, not provide ongoing treatment or preventative care. People without insurance that are getting care only when they’re desperate and through the wrong channels are costing the healthcare system lots and lots of money. They’re waiting until they’re very sick to get care, they don’t access care through cost effective channels and, perhaps most significantly, when they get care from the emergency department they don’t pay their bills. So who do you think pays for these inflated healthcare costs that are caused by the uninsured? Answer: the insured. In order to provide this level of care at no cost to the uninsured, hospitals must raise prices for the insured. So Obama has proposed a solution that will alleviate the suffering for the uninsured and the suffering of the insured. This solution is a law that requires everyone to have health insurance. The mandate. And this is the controversial point in the Affordable Care Act. But it shouldn’t be that controversial. For a lot of reasons. For one, nobody actually has to get health insurance. If you believe that being uninsured is part of your freedom as an American, no problem. You’ll just have to pay a slightly higher tax rate each year (not more than a 1% increase). Also, of the 30 million that are uninsured, most are going to be getting insurance anyway as a result of some of the other components of the law such as expanded Medicaid to individuals with higher incomes and increased insurance coverage requirements for employers. In addition, if you make less than what is required to file a tax return (somewhere around $9k/year) then you are obviously exempt from any tax penalty that comes from not having insurance. So the fight over the mandate is really only about a group of approximately 7 million people (about 2% of the population). 7 million people that are costing those of us that are insured a lot of money because they delay care and don’t pay their healthcare bills. And all the mandate is doing is asking those 7 million people to either get insurance or pay a slightly higher tax rate (not more than 1%) to make up for what they’re costing the system. When you look at it this way, suddenly the mandate doesn’t seem like such a big deal. Regular readers know that I'm a big fan of Mike Bloomberg. I wrote about him in an earlier post back in 2008. Chris Dixon interviewed him for TechCrunch’s Founder Stories series last November. It's an insightful and inspiring interview -- I recommend watching when you have some time. Here's some of the highlights/insights for me. I’m paraphrasing Mike, of course. One of the goals of New York City is to have a park within a ten minute walk of every New Yorker. The business goals for New York isn’t to pay companies to come here through subsidies, it’s to create an environment where people want to live. That means great culture, parks, schools and reduced crime. Big companies are like governments in that they setup very reasonable bureaucracies to minimize risk. But that bureaucracy is what prevents them from innovating. That’s why we need startups. The United States is committing suicide by not giving citizenship to foreign entrepreneurs. People talk about making New York more of a hub for college education, much like Boston. It turns out that there are more undergraduate and graduate students in New York City then there are people in Boston. There are 13 public golf courses in New York City and Staten Island's land mass is almost 25% park. Any data set is a lot more useful if you segment it. As an example, let’s say you find out that your e-commerce website converts at a rate of 3%. That is, for every 100 visitors, 3 make a transaction. That’s somewhat useful data, but it isn’t actionable -- i.e. you can't do much with it -- until you segment it. You need to break the users into segments: by gender or age or income, etc. When you do, you’ll find actionable insights that will allow you to take actions that will increase your conversions. For example, you might find that men between the ages of 30 and 40 that make more than $100k per year actually convert at the rate of 20%, but that most of your site’s visitors are in lower converting segments, thus the aggregate 3% conversion. With information like this you can adjust your marketing to bring more higher converting users to your site -- you'll get more marketing bang for your buck. We must do the same with our unemployment data. The unemployment rate -- last time I checked -- was 9%. This number is quoted over and over again in the media as if, by itself, it actually means something. 9% unemployment is not actionable. It must be segmented. For example, the U.S. unemployment rate for those with graduate degrees is 2%, college grads 4.5%, high school grads 9.7%, non-high-school grads 15%. It’s critical to recognize the difference between these segments. The data is telling us that for the educated segment of our population, unemployment is at or well below its natural rate. But for the uneducated population it’s super high. This is actionable data. This tells us that there isn’t necessarily a shortage of jobs. There may actually be a shortage of qualified labor. Politicians should keep this segmentation in mind when evaluating "job creation" vs. "job training" programs. I came across what was supposedly a very, very controversial graduation speech given by a right wing talk show host to students at Texas A&M. It turns out that the speech was simply a chapter in his (fictional) book. Much of the speech is totally over the top. But if you’d like to get your blood flowing you can check out the entire speech here. Speaking of earning, the revered 40-hour workweek is for losers. Forty hours should be considered the minimum, not the maximum. You don’t see highly successful people clocking out of the office every afternoon at five. The losers are the ones caught up in that afternoon rush hour. The winners drive home in the dark. Also, related to this topic, Salon.com had a good article a while back on the advent of the 40 hour week, that argues bringing it back would increase productivity -- interesting read when you have a few minutes. I recently read Michael Lewis' new book, Boomerang. It's a fascinating book about the recent European Debt Crisis. Like most of Lewis' books (especially The Big Short, that chronicles the U.S. financial crisis) he's able to take a fairly mundane topic, roll it up into a few hundred pages and make it a page turner. The book dives into the crises that occurred in the last few years in three countries: Iceland, Greece and Ireland. It's a fascinating and very well written book. It gives the inside story on the political, economic and cultural circumstances that led to the unlikely collapse of three different economies. If you're interested in European economics, politics or culture, I can assure you that you that you'll enjoy reading Boomerang. Our current system of teaching kids to sit in straight rows and obey instructions isn’t a coincidence—it was an investment in our economic future. The plan: trade short-term child-labor wages for longer-term productivity by giving kids a head start in doing what they’re told. Large-scale education was not developed to motivate kids or to create scholars. It was invented to churn out adults who worked well within the system. Scale was more important than quality, just as it was for most industrialists. Every year, we churn out millions of workers who are trained to do 1925-style labor. Are we going to applaud, push, or even permit our schools (including most of the private ones) to continue the safe but ultimately doomed strategy of churning out predictable, testable, and mediocre factory workers? There are so many examples in the mainstream news of companies not adapting and failing as a result (Research in Motion and Kodak are a couple of the most recent examples). The markets change, competitors take market share and the companies that don't adapt fail and fail fast. There's no secret here. In fact, I would bet that most school administrators and politicians could explain exactly why Research in Motion is failing. But our schools -- possibly our most important public institution -- are doing exactly what RIM did, and to some degree are experiencing the same fate. Yesterday when writing about David Goldhill's piece on health care in the Atlantic, I noted that he noted that the average American will spend $1.77 million on health care in their lifetime (this includes their employer's contribution). This is an astounding number. I thought I'd do my own math. And when I did, I actually got a number slightly higher than Goldhill's. Here's my math. Assume you start paying the average family health insurance rate of $12,000/year beginning at the age of 26. You continue paying that rate until your death at, say, 85. Assume the cost of health care increases at a rate of 3% per year. Using the future value function in excel, that's a total of $2.02 million in health care payments over the 60 years that you're paying for health care. And keep in mind that this assumes that the rate that health care costs are rising is only 3%. Given the increasing cost of health care over the last several years this is a very conservative number. If health care costs continue to increase at their current rates, we could be paying twice that amount. by 1954 most people still didn't have health insurance but that's when Congress passed a law making employer contributions to employee health plans tax deductible without making the resulting benefits taxable to employees. the price of LASIK treatment, an uninsured procedure, has nosedived over the last several years because it is subject to the forces of competition.